Maryann Roefaro’s experience has shown that every relationship we have begins with the one we have with our self. Committed and dedicated to her self-mastery journey, she is inviting and encouraging others to do the same. “We have incredible power within the recesses of the self. Although many aspects of such may remain a mystery to the human mind, we have the innate ability to discover the Divine gifts and power within, if we sincerely commit to the never-ending journey of self-discovery and mastery." 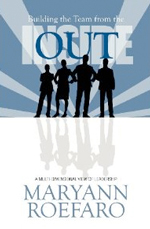 Maryann passionately blends these concepts with her leadership philosophies in Building the Team From the Inside-Out, a multi-dimensional view of leadership. Her newest book, "A Human's Purpose by Millie the Dog" is dedicated in total to an individuals never-ending self-mastery journey. Maryann began her career in 1981 after graduating from Albany College of Pharmacy as a Medical Technologist, passionately pursuing a career in Clinical Microbiology and Immunology. Subsequent to positions as a Microbiology Section Head and Laboratory Manager, her career transitioned into leadership positions as a Healthcare Administrator in primary care. She went on to receive her Master of Science Degree from Upstate Medical University in 1988. In 1996, she was hired as the Vice President of Ambulatory Care Services at Crouse Hospital in Syracuse, NY, developing and implementing many new programs and services for the Central New York health system. In 2002, she was hired as Chief Executive Officer of Hematology-Oncology Associates of CNY and maintains this position today. Maryann cites her position at Hematology-Oncology Associates, the largest provider of cancer care services in Central New York, as having the most significant impact on her self-mastery journey. It was in this position that Maryann was motivated to continue her studies through the American Institute of Holistic Theology, receiving a Doctor of Divinity Degree in March of 2009. She also became an ordained minister through Metaphysical Universal Ministries in June of 2009. Maryann is a board certified fellow in the American College of Medical Practice Executives. Since 1990, Maryann has held a clinical associate professorship at Upstate Medical University. She maintains an active role on various community boards. She is the current Board President of Hospice of CNY and Cancer Connects, an organization that Maryann co-founded to facilitate the mind/body/spirit journey through cancer. She has won various awards for distinguished leadership and volunteering efforts.